Once upon a time, an old man lived in a nice house, out in the woods, off the beaten path. 'Twas no hovel, but 'twas no Versailles, either. The cupboards were sufficiently stocked, and no gowns were threadbare. Verily, at times there was want, but the old man did a fairly decent job of fulfilling the role of provider to the residents of the house. He had even managed to adorn his home with a small room full of books, for he was a great lover of knowledge, and a few meager decorations, for he was also a great lover of culture. Above all, he realized the value of a well-rounded personality, and sought to thereby enrich his fellow residents with these accoutrements. One day, as the old man was tending his kettle-pot over the kitchen hearth, stirring his porridge, he heard a knock at his door. As he answered, he was greeted by an intelligent, nicely dressed man, a traveller—obviously not from this neck of the woods. As a practitioner of Father Abraham's hospitality to strangers, the old man invited the traveller into his modest abode and engaged him in fellowship. Soon, the pleasant traveller departed. The old man turned his attention back to stirring his porridge and providing for his household, as the traveller ambled down the path, scattering autumn leaves with each step, whistling a stardust melody, and pledging to one day return if such an opportunity ever presented itself. Years went by; this brief and unremarkable visit became consigned to the mists of time, filed away in an inaccessible region of the old man's brain with the rest of the infinitesimal daily minutiae of his everyday life- until one day, as the old man was minding the porridge, a familiar knock sounded at his door. Opening it, he saw it was the traveller, intelligent and nicely dressed as was his custom, standing on the doorstep. Inviting him in, the old man quickly noted the seriousness of purpose on the traveller's face as the strange man began to speak. An object which, in my home land, would bring forth much gold. I'll sell it and give you the profit. You could then mend your library, once it has been sold. As base and meager as you can stand." The old man listened closely to the traveller. He thanked the traveller for coming and bade him farewell, telling him to return in a fortnight while he thought about the traveller's proposition. So the old man thought about it. And he thought about it. And he thought about it some more. The traveller made some good points, but something didn't feel right to the old man. He sought counsel with the other members of his household, but they couldn't agree. The old man still didn't know what to do. After a few more days had passed, the old man realized what he needed to tell the traveller. He looked inside himself and felt ashamed that he hadn't been able to summon the courage to accept what his heart had told him all along. The old man had known the whole time what the right thing to do was, but he realized that he had been going around, asking and hoping for someone to change his mind on the subject instead of doing the right thing from the beginning. Doing the right thing, the old man realized, was also doing the hard thing. He summoned the traveller to his home, and began to speak. 'Twas given to me, a gift from our town pioneers. I let them get burned like a baker. Is what this hasty transaction doth speak of me. Situations no matter how dire." As the old man finished speaking, the traveller came to see a truth in what the old man said. Any dominion so morally bankrupt as to mortgage its proud past for an uncertain future sells its soul for a mere pittance. Any man, any household, any hamlet, county, duchy, state, or republic that would entertain trading the jewels in its crown for a fleeting moment of security deserves neither. The traveller thanked the old man, and left. The old man went back to tending his porridge, the purple dusk encroaching on his humble abode. "I am richer today than I was yesterday," he thought. And they all lived happily ever after. What do you think about this faerie tale? 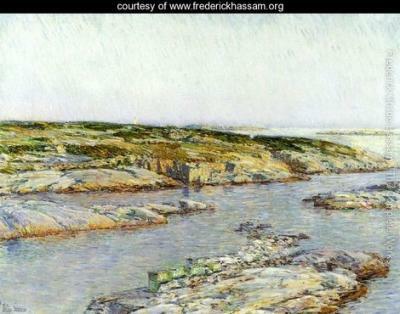 If you think we should save the Blasco Library's "Summer Afternoon, Isle of Shoals" by American impressionist Childe Hassam, you should join the hundreds of people who are members of the Facebook group "Save the Hassam!!!" to learn how you can help. If you think we should sell the Hassam, you should join the Facebook group…oh wait, there isn't one.